I opened up my RCR Wireless News today. 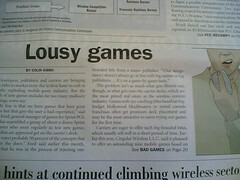 The center lead story "Lousy Games". Below is some of the article that I think is really good, besides the continuation link, which reads "See BAD GAMES on Page 20". Developers, publishers and carriers are bringing new titles to market every day in their haste to cash in on the exploding mobile-game industry. But the crush of new games includes far too many mediocre offerings, some say. "My fear is that we have games that have great names but that give the user a bad experience," said Jason Ford, general manager of games for Sprint PCS. ... We reject probably 50 percent of the concepts that come in the door," Ford said earlier this month, adding that he was in the process of rejecting one branded title from a major publisher. "(Our acceptance) doesn't always go in line with big names or big publishers. ... It's on a game-by-game basis." The problem isn't as much what gets filtered out, though, as what gets onto the carrier decks, which are the most prized real estate in the wireless content industry. Games with eye-catching titles based on big-budget Hollywood blockbusters or noted console franchises often get premium deck placement and may be the most attractive to users trying out games for the first time. The key to creating more quality games is moving beyond traditional games to titles that take advantage of the platform, said Erickson. While the wireless phone is an undeniably poor platform for traditional games, game makers have yet to take full advantage of its connectivity and mobility. Publishers should also develop games that offer self-refreshing content, Erickson said, encouraging user interaction and extending a game's life cycle. "A law imposing a $50 fine for those using cell phones while driving goes into effect Friday. The fine increases to $200 if the driver gets in an accident while talking on the phone." This law went into effect on July 8th. I find it ironic that in a city where no helmet law is enforced for motorcycle riders and smoking is still permitted in public areas, that phones while driving are banned. Im not saying that they shouldn't be, Im just saying I find it rather ironic. I don't think I'd get accomplished half the business meetings that I need to, if that were the case here. As we begin to see MVNO trends really take shape, how does the experience to the user change? I've been thinking quite a bit about this lately. Disney, ESPN, and AMPed are just a few rather new MVNOs, which will begin to shape how users experience the mobile lifestyle. Instead of having to deal with a carrier middleman, content providers will be able to control the whole experience down to the billing and payment. It will be much more about brand recognition, and much less about infrastructure quality. The service pricing will influence the brand. Service pricing will be just as much a part of the brand, as much as a brand will be about its pricing. What sort of implications will this have on brands? Will it mean that one is more premium, one is more economical? What is the monetary essence of Disney? It is especially interesting, too, to consider the type of targeted content that will now be available. As a third party developer knowing that all my users are age 18-25 on X MVNO makes it much easier to deliver a specific product to a targeted demographic. More specificity will be available, and as such, more opportunity to sell directed content. This I see as a big win for many different parties. Even more so, though, as a designer I am interested in how this new "total experience" is going to influence the consumer experience in each product. In general, I think it could make the whole experience easier for users to understand. From an interaction stand point, the experience will now be more inclusive: hardware purchasing, service, and content will all be controlled by one brand. Bundling all these price points to really drive a product, both limits choices but makes things much easier on the end user. [Apple does this very well!] For example if I want to purchase the latest mo-blogging phone software, maybe my MMS service becomes cheaper. Or if I want streaming TV or radio, maybe my dataplan is automatically unlimited, without me having to choose that option too. The focus shifts from service to function. What do I want my portable device to do? The pricing, service, and even hardware for the best experience could then naturally come along with it. I see a big powerful shift beginning to emerge. As we understand better how to cater the entire experience, I think we could also see content adoption process eased and more varied [not just games, wallpaper, and ringtones] content sales.